This recipe comes to us courtesy of Caroline Foster’s blog, Galley Pirates, a great resource for cruising chefs and landlubbers alike. Find more great recipes at galleypirate.com. 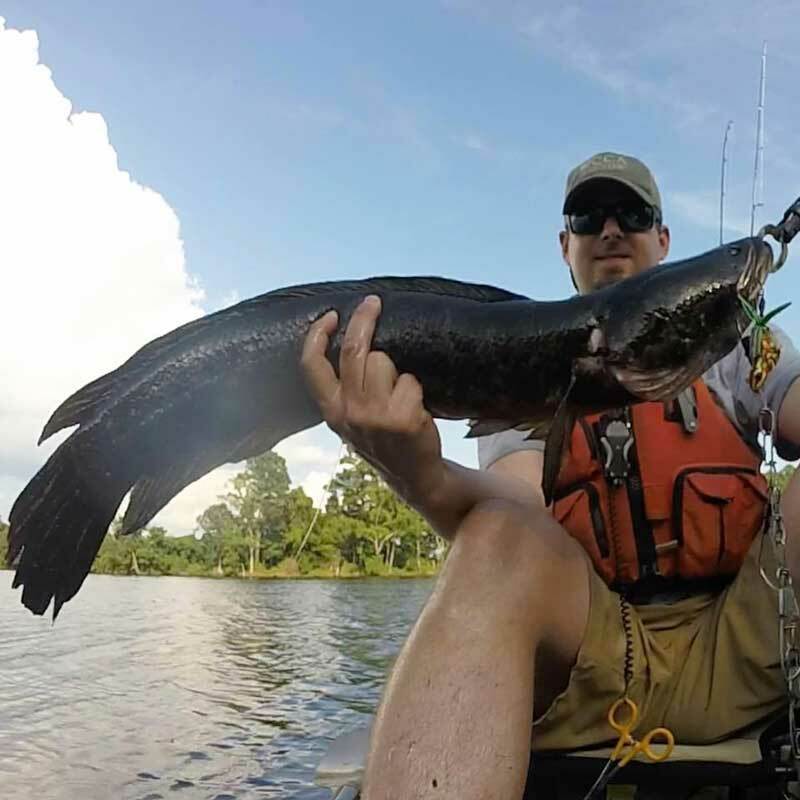 PropTalk's Zach Ditmars caught the 31-inch northern snakehead at Blackwater NWR in Cambridge, MD, that was prepared for this dish. 1. Cut the snakehead into two-inch pieces. 2. Next, make the paste of turmeric and ginger. It’s best to wear gloves to avoid turmeric stains. 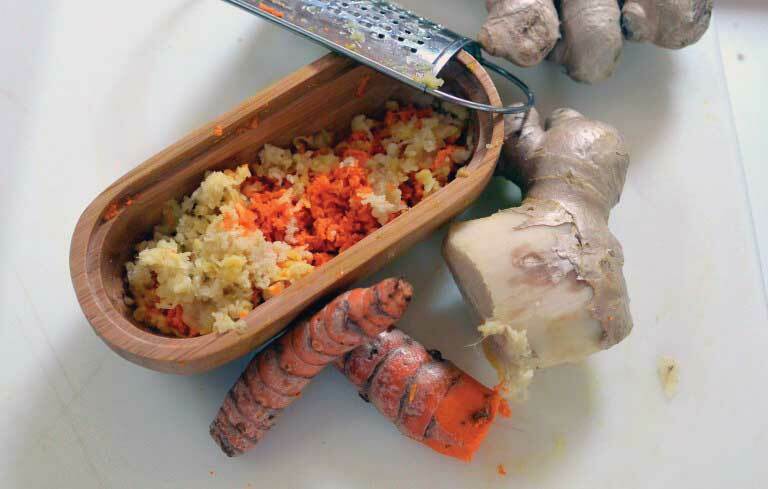 With a food processor or fine grater, grate the fresh turmeric and ginger into a paste. You’ll want to end up with about a half cup. Transfer to a stainless-steel or glass bowl. 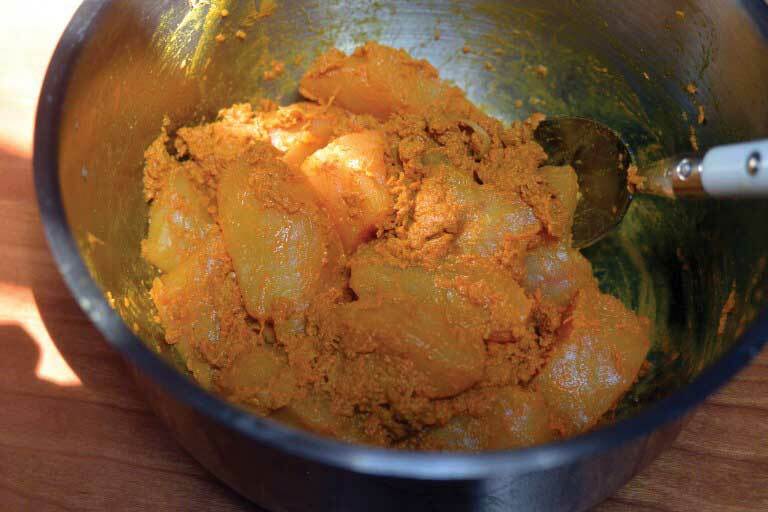 Add the powdered turmeric and fish sauce. Place the snakehead chunks in the marinade and rub mixture all over fish. Refrigerate for at least one hour or overnight. Place the snakehead chunks in the marinade. 3. Chop the scallions into two- to three-inch pieces. Slice lengthwise into long slivers. Roughly chop the dill, removing large stems. Mince the mint, Thai basil, and cilantro. 4. 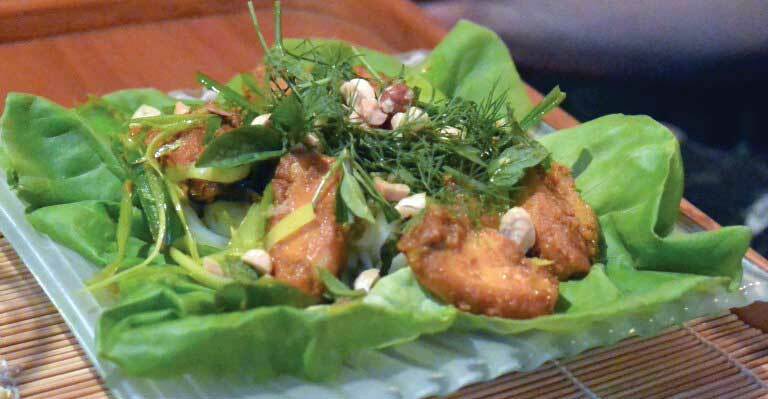 Cha Cá Lã Vong is traditionally pre-cooked by grilling or baking before frying, but it’s not necessary to pre-cook. Preheat your oven to 400 degrees. Lay a non-stick sheet of aluminum foil on a baking sheet. Bake in your preheated oven for eight to 10 minutes. Remove to a dish while you prepare the rice noodles and stir fry. 5. Bring a pot of water to a boil. Place the rice noodles in the water and boil until al dente, about five minutes. Drain. 6. Place bibb lettuce on individual plates. With tongs, lay cooked rice noodles on the lettuce. 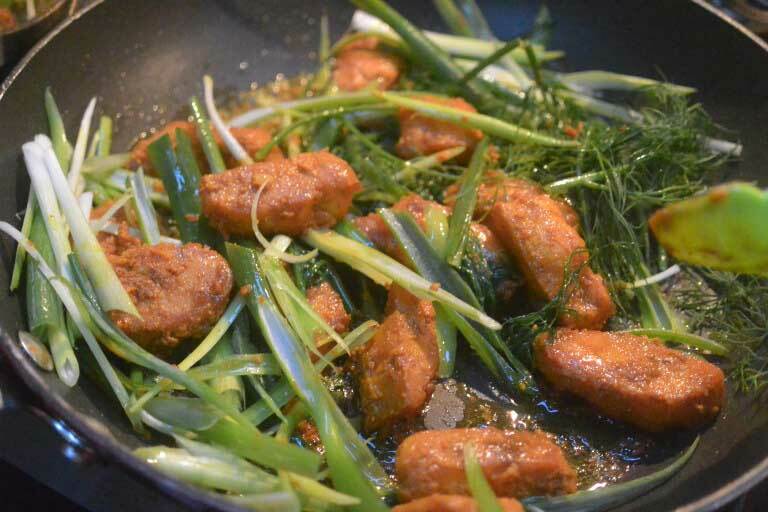 In a large skillet, fry the snakehead pieces. 7. In a large skillet, heat up the canola oil. Fry the snakehead pieces for one to two minutes per side. Add the dill and scallions, turn off the heat, and stir the ingredients together until the greens have softened a bit. 8. With tongs, place the Cha Cá Lã Vong on each plate, on top of the noodles. Add chopped peanuts, minced cilantro, Thai basil, and mint on top, and serve with spoonfuls of nuoc cham. 9. Juice 1 lime. Press the garlic cloves and mince the cayenne peppers. Combine all ingredients in a jar and shake well. Refrigerate. For our Oysters Rockefeller recipe, click here. For our Rockfish Cakes recipe, click here.